Gen Xtinct: Hi-Yo, Silver! Get me an Orange Julius! Back before Tiffany and Debbie Gibson turned suburban shopping malls into concert venues that drew thousands of screamy, fainting fans, mall celebrity appearances were much more subdued, lower-key events. Take Crossroads Mall in Saint Cloud, Minn. (Please.) At least two high-profile visitors appeared there in the ‘70s -- somewhere between the Shirt Shack and Sears -- and seeing them in the flesh had a much bigger impact on this 10-year-old kid than watching Justin Bieber wave, then get shuffled away by security ever could. 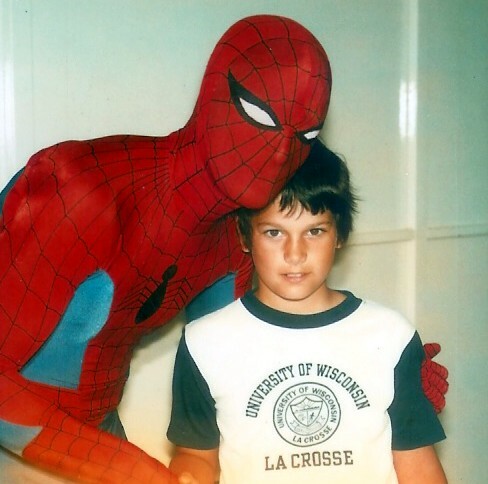 Spider-Man himself showed up one time, and I got to get my picture taken with him. Note the I’m-extremely-cool-because-I-know-a-superhero-and-I-can-call-him-any-time-the-Green-Goblin-shows-up-in-Saint-Cloud expression on my face. But the best visit was Clayton Moore, the Lone Ranger. This was during the period when he was legally banned from wearing the mask and blue suit, so he showed up with Foster Grant wrap-around sunglasses. But he was still the Lone Ranger to me. Most kids were probably watching “3-2-1 Contact” after school, but I tuned into 25-year-old reruns. I’d rush home, eager to return to the thrilling days of yesteryear to immerse myself in the continuing adventures of The Lone Ranger, Tonto and Silver. At the mall, I remember thinking even then that there should have been far more people waiting in line to meet this iconic actor. Maybe more people would have shown up if he would have put on a jean jacket and fingerless gloves and sang a few tunes.